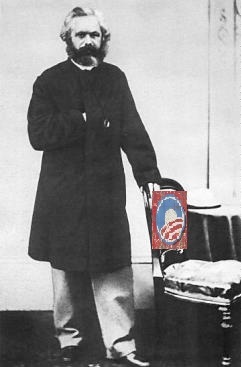 Our ECOTUS (Empty Chair Of The United States) shares more with Karl Marx than an admiration for empty chairs, Obama & his Regulatory Czar, Cass Sunstein, share with Karl a desire to do away with private property rights (gradually of course, progressively, don't scare people!, for goodness sake, just start by spreading the wealth around, then requiring govt to approve of private property, etc), isn't that great! "In this sense, the theory of the Communists may be summed up in the single sentence: Abolition of private property. " 10. Free education for all children in public schools. Abolition of children’s factory labour in its present form. Combination of education with industrial production, &c, &c."
By moving gradually, progressively, step by step, the enlightened ones will move "to wrest, by degree, all capital from the bourgeoisie, to centralise all instruments of production in the hands of the State", and it's working pretty well, isn't it? #10 Dept of Education? Common Core Curriculum? Race To The Top? #9 Have you ever heard of Sustainability? The Farm Bill? Govt directed Smart Grid? Agenda 21? #8 EEOC? And what did Obama mean by that " 'we need a civilian national security force" comment? Hmmm. #6 FCC? Net Neutrality? Dept of Transportation? FAA? And let's not forget TSA. Remember, baby steps. #4 If you're finding some reassurance in this, try thinking of emigrants as those with offshore bank accounts, and rebels as... well, have a cup of TEA and think it over. #2 Hellooo IRS? The agency charged wtih providing the means of 'Spreading the wealth around'? The Enforcement Agency for the ObamaoCare bill? #1 Regulatory Agencies. These are the means of abolishing private property (and Individual Rights) for various 'Greater Good!' causes. See above for reference. As these steps are gradually tightened up, locked down and put into place, and as you may find that you are progressively unable to live your own life any longer, and as you may want to go complain to someone about it... you know what you'll be facing in your quest for Justice? Nice Post Van. We ain't there yet but it looks like we are down the road way too far to be complacent. It appears that many of the structures are in place. The others, like #9, aren't there but they seem to have a plan ready when the time is right. Overall, a pretty disturbing comparison. Have you seen 2016? Nothing about "The Chair" that I hadn't heard about except it presented me with much detail as to how his mentors were extreme radical Communists/Socialists. It produced in me a feeling of betrayal by the MSM by hiding these facts.